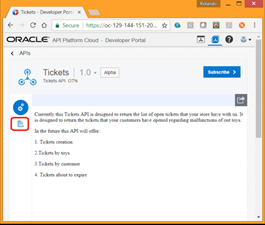 · Using Oracle API Cloud Services - Part 2 Oracle ACE Rolanda Carrasco Rolando shows you how to publish APIs to the API Portal, register an application and subscribe to an API, generate an API key, and more in part 2 of his series on the Oracle API Platform Cloud Service. Read the article. 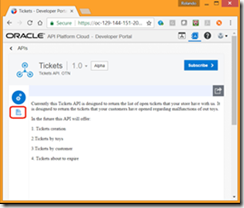 · Podcast: Blockchain - Beyond Bitcoin Blockchain has emerged from under Bitcoin's shadow to become a powerful trend in enterprise IT -- and something that should be on every developer's radar. This program assembles a panel of blockchain experts to discuss the technology's impact, examine use cases, and offer suggestions for developers who want to learn more. Listen to the podcast. · Happier Users and IT During the 1960s and ’70s, there was much debate on whether the US should be investing many billions of dollars in its space program versus more “pragmatic” concerns. One powerful argument for that investment was that the space program would yield a “dividend” of ancillary benefits to society that would far outweigh the direct investment. Consider just one example: the global GPS systems. The cloud dividend debate has taken a similar arc over the last decade—weighing the benefits that cloud users get beyond the service itself. In my latest Forbes column, I detail three of those dividends and propose that there’s now a fourth important one: put simply, using cloud services makes people happy.